Make a truly passionate and bold statement with this Valentine's bouquet of 12 Red Roses, complimented with splashes of gypsophila, fragrant eucalyptus and a palm leaf frame. Included in this Valentine's gift bundle is a delicious box of chocs and cute teddy bear. 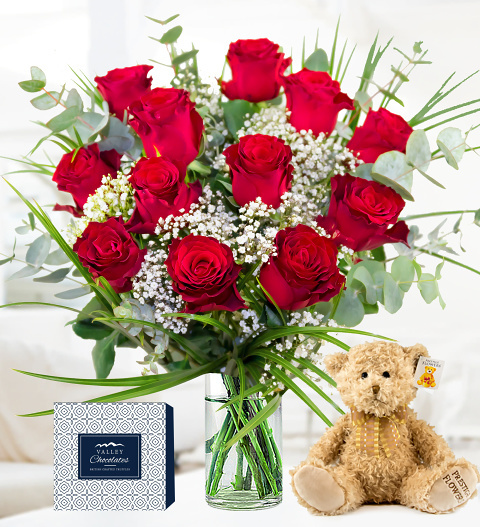 Valentine's Flowers are the perfect gift to spoil that loved one with this Valentine's Day! This long lasting red Rhodos rose comes with an average head size of 5cm measured from base of the head to the top.